Gardai get Darren Bradley of The March for The Homeless to move his van from the street at Grafton St last night. People gather at The March for The Homeless Stand at Grafton St last night. 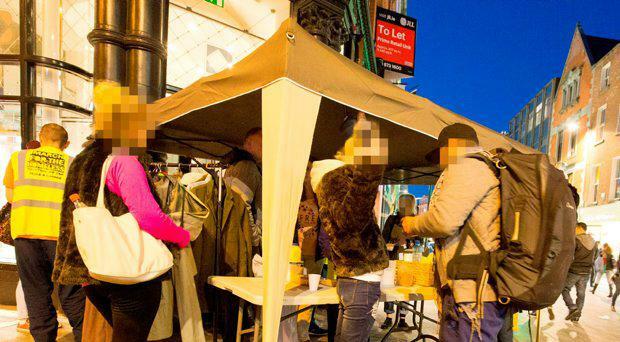 Volunteers running a soup kitchen for homeless people were left “shocked” after their stall was shut down by gardai on Grafton Street because they didn’t have a permit. The group, March for the Homeless, said what happened was “heartbreaking”, leading the minister with responsibility for solving the crisis to say that groups like theirs should be “facilitated” in continuing their work. As the latest homeless figures show 120 people sleeping rough on the streets, Environment Minister Alan Kelly called for “common sense” on the issue of permits for volunteers trying to help them. March for the Homeless volunteers were back on Grafton Street last night in defiance at the order from gardai to pack up and leave over the weekend. “We won’t be going anywhere,” organiser Darren Bradley told the Herald. Last night on Grafton Street gardai approached the group and asked Mr Bradley to move a van that was parked nearby. However, the volunteers were allowed to set up the kitchen and serve food. It was a stark contrast to the weekend, when Mr Bradley said officers told his colleagues to shut down the stall for “health and safety reasons” as homeless people queued for food. “They took volunteers’ names and addresses, which really shocked me, and told them never to come back,” he said. Mr Bradley said the group normally give out meals like chicken curry, spaghetti and sandwiches as well as toiletries, clean clothes and sleeping bags. A Garda spokesman said that officers were called to Grafton Street where a temporary structure was set up, adding that “it was attracting a significant amount of people”. “Those involved in setting up the structure did not have permits from Dublin City Council and were asked to remove the structures on the grounds that they were causing an obstruction and were a safety concern. “We would ask anyone who wishes to set up structures on streets in the city to liaise with Dublin City Council,” he said. March for the Homeless hit the headlines last week when one of its volunteers, Sarah Jane Curtis (19), brought homeless man Adam Skinner (21) to her Debs. Separately, Dublin Simon Community’s Sam McGuinness said that government interventions have had no impact on the homelessness crisis. He was speaking as he launched the charity organisation’s annual report. Their latest figures show that 120 people were sleeping on the capital’s streets on Monday night. Another 50 people sheltered at Simon’s night cafe. “The numbers speak for themselves and clearly (State) interventions to date have not been effective,” he said, with the situation being described as a “humanitarian crisis”. “We are now faced with a catastrophe where, nine months on from the tragic death of Jonathan Corrie in front of Leinster House, the numbers who are rough sleeping have grown – despite the provision of 207 extra beds over Christmas last year,” said Mr McGuinness. The organisation assisted more than 3,000 men, women and children across Dublin, Wicklow, Kildare and Meath in 2014. Responding to the launch of the annual report Mr Kelly said he “certainly believed” that there is a humanitarian crisis. “Homelessness is always a serious issue and absolutely everything that can be done will be done – and is being done in relation to ensuring that we can protect people,” he said. He said he met with Dublin City Council on numerous occasions in relation to facilitating the turnaround of new housing units that had previously been boarded up, adding that funding has been given to services such as night cafes, and emergency accommodation options were being looked at continuously.